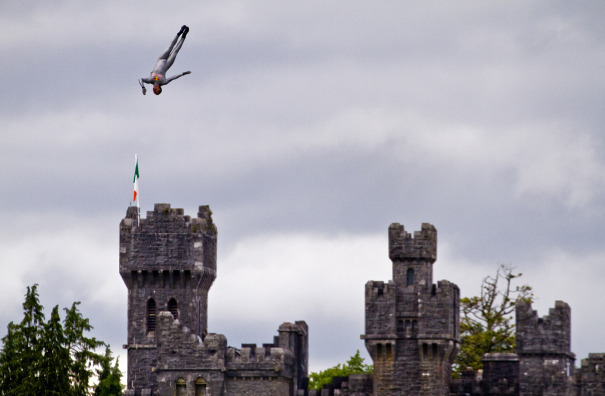 Colombian, nine-time diving world champion Orlando Duque jumped from a helicopter, 23 meters above Ashford Castle, Cong, County Mayo, in preparation for the Red Bull Cliff Diving World Series. The possibly insane competition includes a cliff dive on Inis Mor, one of the Aran Islands, off County Galway. The 11 qualifying entrants, started their diving this month. They will complete seven dives in Europe and North American, before the final dive in Oman, in September. These dives, according to TheJournal.ie last just three seconds as the diver hurtles toward the water at 85kph.